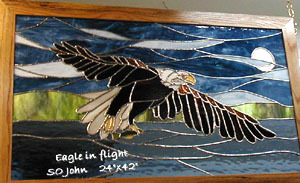 Welcome to the NEW Old Hen House Glass & Craft Shop webpage! We hope we can inspire your imagination to try something new, add something colorful or just come by for a visit and see what we are about! Living up here in �God�s Country� of north central Wisconsin we are blessed with experiencing some of the most exquisite colors that Mother Nature has to offer�. As artists we try to translate it into glass panels, cabinet doors, lanterns and lamps reflective of that beauty to be enjoyed by anyone, anywhere & in any season. And, we want you to learn how to do it too, so we offer a fully equipped retail shop and lessons guaranteed to get you started in this artistic endeavor. Our shop may appear small, but our enjoyment of our craft is not, so WELCOME and come on in! Copyright The Old Hen House Glass & Craft Shop, All rights reserved.